So you’ve received a poinsettia plant over the holiday season, but what on earth are you to do next, now that the holidays are over? Read on to find tips on how to care for a poinsettia after Christmas in this article so you can, hopefully, enjoy your plant year round. With their brightly colored bracts swaddling the plants during the drearier days of late fall and winter, and just in time for Christmas, who doesn’t love the poinsettia. That being said, once the holidays are over, many of us are left with questions about what to do next. Do we keep the plant or toss it? 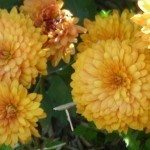 After all, won’t there be another one available next year, like the ever abundant chrysanthemums lining storefronts and nurseries each fall. Well, the good news is that caring for poinsettia plants after Christmas is possible BUT keep in mind that your poinsettias after holidays will require specific attention. After Christmas poinsettia care begins with suitable growing conditions. If you’ve taken care to keep your poinsettia in a nice, warm sunny window (free of drafts) thus far, you’re halfway there. It should receive at least 6 hours of bright, indirect sunlight each day. 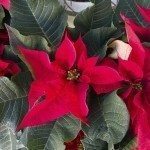 For continual bloom of your poinsettia care following Christmas, the plant also needs day temps between 65 and 70 degrees F. (18 and 21 C.) and slightly cooler at night, though keep it above 60 F. (15 C.) to avoid leaf drop. Continue your normal watering routine until spring (or first of April), then allow it to dry gradually. Around the middle of April or May, or if your plant becomes leggy, cut the stems back to about 4 inches above the soil and repot in a larger container with fresh, sterile potting mix (soilless mix is good too). Note: You can remove any faded or dried parts of the plant anytime. Water thoroughly and then put the plant back in a sunny window. Check the poinsettia periodically to make sure the plant has adequate moisture. Water again only when the surface of the soil is dry to the touch. After new growth begins, feed your poinsettia every couple weeks at the recommended rate with an all-purpose houseplant fertilizer. In early summer, when nighttime temperatures remain above 50 F. (10 C.), you can move the plant outdoors (in its pot) in a slightly shady location. Gradually, allow the plant to get more light until finally giving it full sun. Continue watering and fertilizing the plant as usual. Trim again as needed in summer (typically around the first to middle part of July), pinching about an inch of terminal growth from each stem. Give it another pruning towards the first part of September. Trim off two to three inches to promote side branching, allowing 3 or 4 leaves to remain on each shoot. By this time, it should be getting cool enough outside, 55-60 F. or 12-15 C., to warrant bringing the plant indoors near a sunny window. Once again, maintain similar indoor temperatures as before (65 to 70 F. or 18 to 21 C.) and continue watering and fertilizing. Now comes the fun part… getting it to bloom in time for Christmas. Poinsettias require short day lengths to bloom and form those colorful bracts we love so much. Begin keeping your poinsettia in complete darkness for about 12-14 hours from the first part of October until Thanksgiving – or an 8- to 10-week period. Simply stick it in a closet or cover with a large box every evening and then return the plant to its sunny window during the remainder part of the day. By Thanksgiving, you should be able to stop the dark period altogether, placing the plant in a sunny area for at least six hours daily. Reduce water and fertilizer. Then, by Christmas, your blooming poinsettia, hopefully, will be the centerpiece of holiday decor and ready to begin the cycle anew. While there’s no guarantee that your poinsettia will bloom again even with the best care, it’s certainly worth a try. Remember, though, that foliage is pretty too. Caring for poinsettia plants after Christmas is that easy. 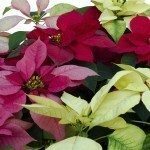 Read more articles about Poinsettia.